If nothing else, Burger King has earned some street, if not social media cred, for its ongoing campaign clowning its larger fast-food competitor, McDonald's. 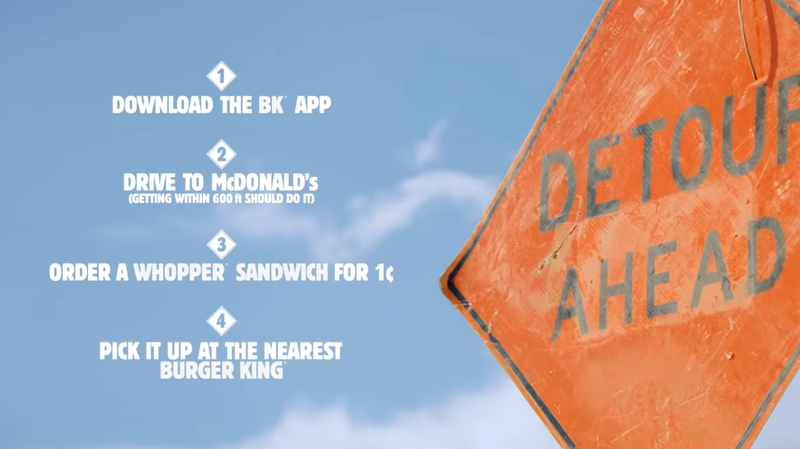 In their latest volley against the burger behemoth, yesterday Burger King launched its latest promotion - The Whopper Detour. The deal goes like this - download the Burger King app on your smartphone, and then go to any of over 14,000 McDonald's locations nationwide, and when you are within 600 feet of the restaurant, open the Burger King app to activate the 1¢ Whopper deal. Not only will the deal be activated, but the app will also lead you to the nearest Burger King outlet. Aside from poking their more entrenched competitor in the eye, and getting some free publicity, the promotion is also intended to promote their updated app which now allows order-ahead capability. Separately, Burger King plans to roll out in-store ordering kiosk in the coming months. In what has been a historically competitive segment of the restaurants business, Burger King, as well as another burger competitor, Wendy's, have taken to social media to troll competitors with snarky marketing techniques. During the height of the net neutrality controversy, Burger King, who favored net neutrality, spoofed the change in a widely viewed video, and more recently clowned McDonald's by offering free Whopper sandwiches to anyone who came to their restaurant on Halloween dressed as a clown. The WHOPPER Detour promotion can be redeemed one time only, from December 4th until December 12th, at participating BURGER KING restaurants nationwide. No Comment to " Ronald McDonald clowned again - Burger King trolls Mickey Dee's with 1¢ Whopper "